This is part three of a series on 'The Web and the High Street', and is a guest post by Jonathon Palmer  Commercial Director at Blueleaf. Depending on which papers you read, the high street is supposedly dead. Statistics make for dismal reading, like the fact that one shop shut every hour in 2012, and the issue has now become a political, social and economic one. However, I do wonder, to paraphrase Mark Twain, if the rumours of the death of the high street have been greatly exaggerated. Not so long ago, many people were saying that the internet would kill TV, as people would choose to watch all their programmes online. Yet TV is in good health, for the simple reason that it meets a fundamental human need, and the multi-screen ecosystem sits comfortably around it. Undoubtedly a lot has changed in the world of TV though, and the concept of linear TV now seems frustratingly quaint. In the same way, the idea of fighting congestion and dodging traffic wardens to buy something you can now order at the click of a button seems equally unappealing. 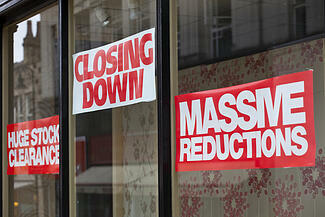 There is no doubt that the internet is the biggest threat to the high street. But could it also be its biggest opportunity? To grasp this opportunity requires, at the very least, an open mind, and maybe even a complete reimagining of what constitutes a shopping experience. Consumer behaviour will continue to change. Digital natives are due to supercede traditional consumers and even digital converts by 2020, when they will become the largest percentage of the UKs active adult population. The best retailers have always been in the business of keeping up with trends and understanding their audience, therefore adapting to this new reality should be well within their grasp. So, as the digital world continues to shape the physical world of the high street, where are things heading? Where technology is concerned, even small changes can create big ripples. Its only a matter of time for instance, before phone manufacturers like Apple are going to enable the native cameras in their smart phones and tablets to recognise augmented reality codes or patterns. Although it only changes the user experience slightly, by enabling people to use these codes without downloading a specific AR app, it might be just enough to reduce friction to the point where it nudges in widespread adoption of this technology. This would open up all sorts of interesting opportunities for brands that although technically possible now, are not widely used because they arent effortless for the user. For instance, adding a simple AR code to a products packaging could create a digital layer around the pack that could work hard to sell the product. Triggering a digital brand experience by pointing your phone at a product would be easy, and could display product instructions or tell a brands story. Checking customer reviews on a product or finding out whether any of your friends have brought it will be simple and become standard practice instore. As wearable computing such as Google Glass develops beyond its clunky debut (think of photos of early PCs) this will make accessing this digital layer instant and simple. For retailers, this could be a potential nightmare, as show rooming (buying products on display in a physical shop over the internet, through someone else) could turn them into 3D internet show rooms. Ultimately though, the truth is that brands need retailers and retailers need brands. In the dying days of HMV, music publishers and film studios were pumping cash into the beleaguered company to keep it alive as it was a critical route to market for them. So, brands and retailers will need to work more closely together and think differently about how they collaborate. They will need to start exploring different commercial models for purchases made from within a physical shop but via the brands own ecommerce channel, perhaps using codes for sales attribution. This might encourage brands to invest in more creative and interactive point of sale experiences. We are already seeing interesting display technology finding its way instore, such as holograms that will recommend food to go with your wine, and better use of touch screens. In the same way we still have a TV in the corner of our living rooms, for some products we will always want to go to a physical shop, touch a product and talk to a human being. However in the same way we dont watch adverts any more, we will not expect to do the parts of the shopping trip weve never really enjoyed. Instead well expect more from our shopping trips and will be looking for better reasons to visit our high street. Leading retailers already get this, and at the top end of the market, Burberrys Regent Street store regularly holds catwalk fashion shows and hosts live gigs with great talent, all of which is filmed and put online. This is smart, as it means that these events not only bring in the punters, but they also generate ongoing content the company can use on their website and across their digital strategy, helping to create social noise around the brand. Tescos new Watford store shows how a more mainstream retailer can reimagine how it uses its physical space, with a combination of cafes, eateries, community space and other reasons to visit and spend time (and money) there. As retailers make better use of big data to make our shopping experiences as tailored and convenient as they can be, it will reduce friction further as consumers flit between their physical and digital offerings. Technology is altering the balance of power between brands, retailers and consumers, and the dust has yet to settle on the new landscape of the high street. Although we need a radically different way of thinking, for retailers the key to the future is ultimately going back to doing what they do best - knowing their customers and giving them what they want.